Click here for the pdf . Debbie’s philosophy toward her business and her customers is different from those of other businesses – and from the success of her store, her philosophy is working. Amid the various pots and pans, the multiple refrigerators and freezers stocked with waiting delicacies, the employees shuffling trays of truffles or dipping cherries into chocolate, stands Deborrah Ball, The Candy Lady. With one hand on her hip and the other wielding a frosting cone, she works quickly and confidently like a culinary Zorro, crafting and carving the cake before her. Behind her, there is a back room attached to the store, and a customer stands there, a police officer who visited the Candy Lady shop for the first time just a week before. He is buying a custom- order cake for his girlfriend, and he and Debbie chat like old friends. He leans against an oven tentatively, trying to scoot out of the way as an employee hands Debbie a fresh bowl of whipped cream. “This is service here,” he says, laughing. It is not often that a customer gets to hang out in the business behind-the-scenes area with the owner, much less even get a chance to see the owner. But Debbie’s philosophy toward her business and her customers is different from those of other businesses–and from the success of her store, her philosophy is working. “I’ve never changed my quality,” Debbie says, whether it’s for her customer service or her sweets. In 1980, Debbie opened her store with the help of her mother, Diana Garcia Davis, the original Candy Lady. Diana, the single mother of Debbie and Harold, had been a technical writer and buyer for Kirtland Air Force Base, but had always made candy and baked goods with her daughter. Candy was sold in little bags for 5 or 10 cents at church or at school. But after an accident in which Diana fell and hurt herself, Diana retired from work and the financial situation at home looked grim. To help her family, Debbie worked odd jobs in roofing, at a bank, and at the University of New Mexico bookstore. In addition, she and her mom started selling candy out of their house, which expanded to fairs, trade shows, and conventions. Slowly, their business grew, and in 1980, when Diana was 54 and Debbie 27, Debbie decided to open a store. Debbie also had by then finished two years at UNM, studying to be a pharmacist, when she decided to change direction and devote herself to the business. The store first started in a different location in the Albuquerque Old Town, near what is now the High Noon Restaurant, but moved into its current location in 1984. At first, there were only eight different kinds of candy, variations of fudges, chocolates, and brittles. New candies were made through experimentation and customer suggestion, and the two women traveled to trade shows in Chicago and other big cities to get ideas and supplies. But it was hard breaking through to the next level, and maintaining the business proved expensive. “A year and a half into it, we just about quit,” Debbie says. Then, a provocative idea formed in Debbie’s mind. A customer had told her about an X-rated bakery he had seen in New York. Debbie decided to offer some adult confections of her own, and what ensued was a flurry of controversy and a pivotal moment for the Candy Lady. North Valley Gospel churchgoers, among others in the city, protested outside of the store and tried to get city officials to shut down the business. Media coverage boomed, and as it did, so did the business. The Candy Lady was featured on Page One of the Albuquerque Tribune and then got covered by the Associated Press, which spread the news nationwide. Debbie smiles as she acknowledges the irony of the situation, and she says the business didn’t need to advertise for five years. “We were very fortunate to get the publicity,” Debbie says, and as more people bought the adult candies, more people realized how good her products are and bought other things. “We could barely make enough to keep up from one day to the next,” Debbie says. Eventually, the brouhaha subsided and the store remained open, but even today The Candy Lady still gets plenty of coverage. The shop was featured on the Food Network’s “Secret Life of… South western” segment, and Frommer’s and Orbitz both recommend the store in their travel guides. The Candy Lady has international fans, Debbie says, and remembers a couple from Germany who came to visit friends in town. The German couple introduced the locals to the candy. Debbie’s adult goods are also as popular as ever and constitute an undeniable force in her business. An entire separate room, dedicated to those 18 years and older, is devoted to the niche creations. That custom-order cake she was artfully attending to for the officer is one of them. It’s in the shape of a man’s torso, complete with toasted coconut shavings on the chest and a large, handmade candy structure not in any shape available next to the register. It’s not the only cake like this she’ll make for the day. But Debbie satisfies other cravings as well, and the Candy Lady offers more than 500 kinds of sweets. 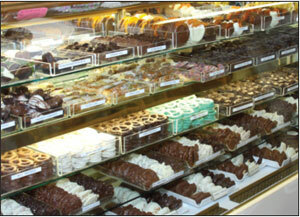 Coconut creams, dipped pretzels, marzipan, jellies, and mints fill the cozy space of the store. Neat trays stacked up with turtles tempt from the display cases. Clusters of pecans, piñons, peanuts, cashews, or almonds sit lusciously for nut-lovers. Nearly everything comes (or can be) dipped in milk, dark, or white chocolate. Imported glazed ginger, peaches, pineapples, apricots, oranges, and orange peel from Australia add color to the nearby toffees and crunches. Rock candy rests happily among pre-packaged children’s favorites like bubble gum and taffy. There are more than 70 kinds of black licorice. One display case is entirely devoted to the more than 19 varieties of fudge available–everything from traditional chocolate to local specialities like chocolate red chile, vanilla jalapeño, and chocolate piñon. Her homemade fudge is one of her most popular sellers, Debbie says, along with peanut butter crunch and turtles. Her chocolate-dipped strawberries, which, Debbie says, she first introduced to Albuquerque, are another huge hit and are made fresh daily. In addition, the store offers more than 25 diabetic kinds of candy, among them raisin clusters, coconut haystacks, almond butter crunch, and truffles. Debbie also offers medicinal candies, such as ones made with peppermint or horehound root, which hint at Debbie’s interest in homoeopathy and alternative medicine. “Everything I have in here reflects that I’ve listened to my customers,” Debbie says. Valentine’s Day is the busiest time of the year for the shop. Her specialities for the holiday include chocolate-dipped strawberries and raspberries, chocolates, and heart-shaped boxes filled with various candy. So, among all of these choices, which is her favorite treat to make? Debbie does have a weak spot for wedding cakes, she says, but ultimately her favorite part of the business is her customers. “I really believe in the whole six degrees of separation thing,” Debbie says, adding that talking to people and getting to know her customers ultimately make her love her job more than creating candy. In fact, she says, she wants to start a forum or contest on her website that would seek out stories from people about their experiences with the store or with her, whether good or bad. She notes that she is often in some way part of a birth or death or some other momentous occasion in a person’s life, and she says she is fascinated to know the details behind a seemingly simple purchase of sweets. On other matters related to her website, Debbie’s face turns into a frown. “I don’t like computers; they’re impersonal,” Debbie says. The website, candylady.com, first started in 1996, but shut down in 2002 because of various difficulties. Within the last year, it was started again and contributes to less than 1 percent of business, Debbie says. She says the thing that distinguishes her from other businesses is her service, and technology is making it harder for that strength to show. All the extra steps she takes, like speciality orders and taste testing, she says, are lost with online purchases. Often, Debbie looks at an online order and feels that the customer wasn’t sure what he or she wanted, so she’ll call the customer and find out what exactly was desired. For example, she says, many people order whole pounds of candy because they think they can only order it in that amount, or that it can only be one kind. She is more than happy to mix and match, and she tells customers of all the possibilities available that are not indicated on the Internet. Debbie is also considerate of food allergies, she says, and will remake candy from scratch with carefully washed and separated materials to fit customer needs. Though the business has certainly seen success, Debbie doesn’t want to expand or move. She did open a second store on Utah and Menaul in April 2001, but she closed it in May 2004 because of difficulties keeping it up. Much of the difficulty, she believes, came from the Sept. 11 attacks, and she struggled financially. She decided to completely devote herself to the sole shop she has now, and calls the store her “bread and butter” location. “If I can’t do it here, I don’t want to (do it anywhere else),” Debbie says. The other issue is the workforce. Diana retired in 1991, the same year Debbie married her husband, Jim, and then Diana passed away in April 2005. Debbie and Jim run the business, and they still do everything by hand without big machinery. Debbie swears by that kind of commitment and considers it the foundation to success, in business or otherwise. She also argues that one doesn’t need the best of everything in one’s personal life, whether it’s the best car or house, to be happy. One pitfall for many young entrepreneurs, she says, is the misuse of profits. “The money that comes in is for your business–it’s not your money,” Debbie says. Another lesson she has learned is that it is imperative to be able to handle the actual business aspect, even if you aren’t an entrepreneur. Good skills in accounting and management are imperative for anyone, especially for young people. And women in particular, Debbie says, need to listen to their intuition. Women have a much stronger sense of intuition than men, she says, but are more afraid to use it. Back in the kitchen of the store, a friend of the police officer has come to visit and stands near Debbie as she finishes the cake. This is the friend’s first time in the shop, and he wears a somewhat incredulous look on his face as he glances at all the spatulas and whisks around him. Debbie doesn’t hesitate–instantly she pulls him into the conversation she was having with the officer, a conversation about how one should write a list of qualities one is looking for in a significant other. Debbie swears by this list method. The friend shakes his head and smiles, a bit of it in disbelief at the situation he has found himself in. The officer laughs. Debbie boxes up the cake, hands it over to the men, and they make their way back to the main room of the shop. Two happy customers leave The Candy Lady, sure to return again soon. Monika studies print journalism and French at the University of New Mexico. She was born in Albuquerque but her family is originally from Poland, and Polish is still the main language at home. She studied at the Université de Savoie in Chambéry, France in the spring and loves to travel.